Hi, I'm Brooke from The Intentional Momma blog. I want to thank Danette for having me! She is such an encouragement to me, and I'm thankful for her! 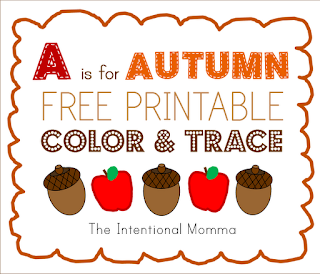 As an educator with a toddler at home, I am constantly dreaming up new activities, and today I am sharing my newest educational freebie--my A is for Autumn Color-and-Trace preschool pack! Featuring apples, ants, and acorns in autumn colors, your little ones can practice tracing, counting, coloring, and matching with this super simple printable mini-workbook. As for me, the A-word that I find myself facing so much as an adult is the word anxiety. I find myself worrying so often! A verse that I must constantly reflect upon is one you probably know. 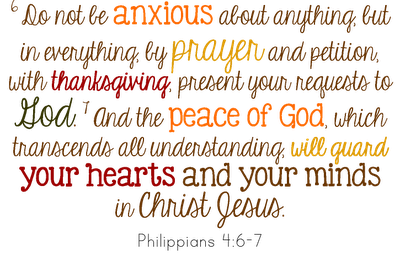 But I'll leave you with this one other printable, also in autumn colors, in hopes that it might be an encouragement to you if you tend to be a worrier like me! This is a lovely post. It is very inspiring and I thank you for sharing. The A is for Autumn is a great idea especially if the kids are observing it around them. In Trinidad our autumn so distinctive so I will have to use the pictures on the internet to know what I mean. I am following on Facebook and your blog and would love for you to follow back.